We've been hearing some rumblings of Space Wolf rumours lately. This makes a lot of sense with Stormclaw having come out recently. Stormclaw introduced a new HQ character, Krom Dragongaze as well as several new formations for the boys in grey (or blue-grey depending on how you roll). Here is the rumour roundup that I've been hearing. 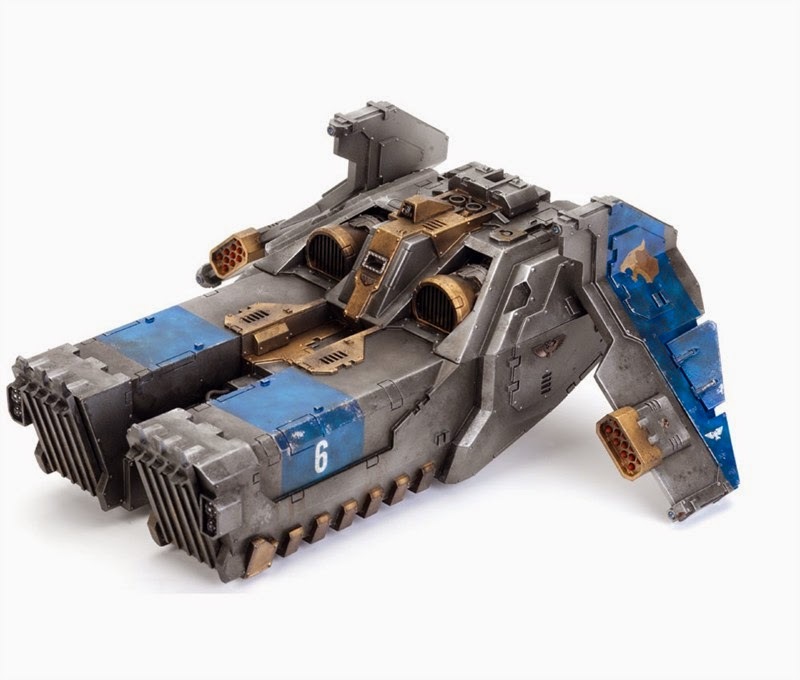 Imagine this thing, but cut in half and with only one "boarding ramp"
The Stormfang supposedly looks like half of a Caestus Assault Ram. I'd imagine we'll see actual photos in several days as the White Dwarf leaks start to happen. The default weapon is called a "Helfrost Destructor", which sounds a lot like something a Necron obsessed Iron Priest would come up with. It has two firing profiles, both 1 shot at 24". The first is a dispersed mode at S6 AP3 Large Blast. The other is a S8, AP1 Lance shot. Both have the Helfrost special rule, but no hints yet as to what that does. I'm anticipating full rules in the White Dwarf, so we'll have less than a week to wait. The Stormfang also comes with two twin-linked heavy bolters that can be upgrades to twin-linked multi-meltas or long range S8 AP2 missiles. And, as one would expect from this type of assaulting ram vehicle, we'll get ceramite plating and power of the machine spirit. I wouldn't be at all surprised to see that this is an assault vehicle. Don't expect to be able to take a Wolf Guard unit and split them up. All signs point to Wolf Guard "squad leaders" being unit upgrades for Blood Claws, etc. Think along the lines of +10 points to upgrade one Blood Claw to a Wolf Guard. 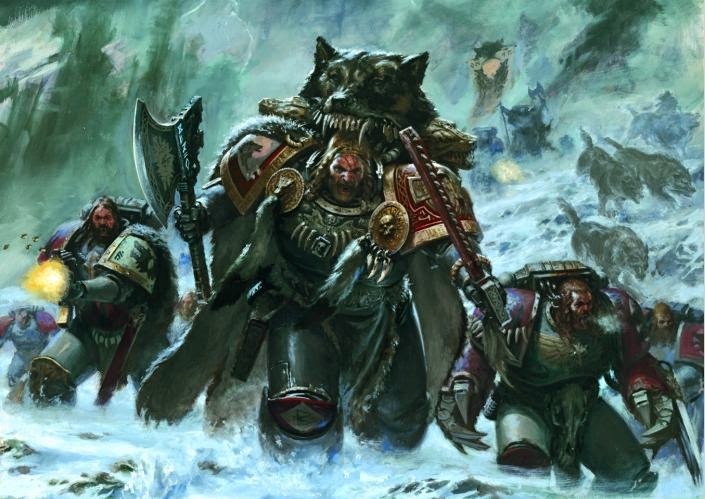 It also looks like Wolf Guard vs. Wolf Guard Termies will be two seperate unit entries, so no more mixed armour units. This also likely means that the Wolf Guard leading a Blood Claw unit won't have the option for Terminator Armour. It really depends on how the upgrades go. Sounds like Herald McWolferton (I forget his real name)... the resin Wolf Lord on Thunderwolf will be getting a name and some rules. The rumour mill is indicating that if taken, he will make Thunderwolf Cavalry a troops choice. Honestly, I'm not sold on this. I think it's more likely that GW will throw in a formation of Wolf Lord on Thunderwolf, 2-3 units of Thunderwolf Cav and 2-3 units of Fenrisian Wolves with some sort of special rules. Lastly, it sounds like the Wolves will be getting access to the newer Space Marine vehicles like the new AA tanks.